A few years ago, not long after Nancy Cantor became chancellor of Syracuse University, she offered a wish about the future of the city. At the time, the hottest question involving SU and the greater community was whether to retain Paul Pasqualoni as football coach. Cantor, who would eventually support athletic director Daryl Gross in his decision to fire Pasqualoni, dreamed of a day when the intensity of civic interest about the future of downtown might match the civic interest in the future of a coach. The real issue, Cantor said, came down to identity: People see a piece of themselves in their football team, which is the same way she hoped they would someday feel about their central city. Three years later, the Pasqualoni debate has been replaced with a football furor over the status of Greg Robinson, the new coach. But Cantor is also dealing with a faculty rebellion triggered by last month's announcement of the dismissal of Astria Suparak as curator and director of the Warehouse Gallery on West Fayette Street. In a sense, that dispute is intertwined with Cantor's wish. The latest expression of faculty anger is a boycott of an exhibition at the Shaffer Arts Building that traditionally showcases the artwork of SU professors and instructors. That show was canceled because the boycott is "100 percent effective," according to a statement written by Joanna Spitzner, an SU instructor and a leader in efforts to retain Suparak. In her statement, Spitzner described how the canceled show will be replaced this week by an alternative exhibit. Holly Greenberg - an associate professor of printmaking - will be among several dozen faculty artists displaying their work in a show that begins Thursday at the Spark Contemporary Art Space on East Fayette Street. Tuesday, Greenberg said she decided to join the boycott because of what happened to Suparak. But she said the deeper issue involves simmering faculty discontent going back to the creation of SU's Coalition of Museums and Art Centers. Under the direction of Jeffrey Hoone, CMAC oversees university gallery space. "When it was formed, nobody from the Department of Art or the College of Visual and Performing Arts was consulted about the best way of uniting our art organizations here," Greenberg said. "Teaching art is our life. 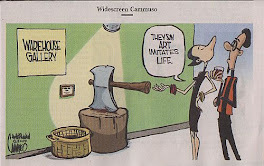 Being artists is our life. I think a lot of faculty were put off," she said, by the way CMAC was created. The Suparak dismissal intensified that feeling, Greenberg said. "Until CMAC is dissolved," she said, "I would hope the faculty would continue to boycott (university) events." The firing of Suparak has captured the attention of city officials, community artists and the operators of several downtown galleries. Considering the history of the arts downtown, what is most interesting - and most hopeful - is that anyone beyond campus even cares. The Warehouse Gallery is the public face of Cantor's ambitious efforts to link the campus and the city. The chancellor was the driving force behind the rehabilitation of the old Dunk & Bright furniture warehouse at West Fayette and West streets. The building was converted into classroom space, mainly for SU's school of architecture. Suparak was in charge of the gallery, until her firing infuriated many at SU. "The dismissal of Suparak, a well-respected curator who has worked with many SU faculty members, is a great loss to this community," Spitzner wrote in her statement. "This action reflects the lack of dialogue the administration of CMAC has with faculty, students and the arts community - the constituents CMAC serves." Spitzner and many others maintain the firing smacked of censorship, since a recent Suparak show included images of homosexuality and genitalia. Hoone and other university officials adamantly deny those charges, and say it was linked to personnel matters they cannot discuss. As for the continuing existence of CMAC, Kevin Quinn, an SU vice president for public affairs, said the university will continue to "support CMAC and (we) believe it is the right idea, but we have had conversations in the past and will continue to have conversations to ensure that CMAC is well-aligned and fully engages our faculty, campus and community." For those of us without the expertise to offer even peanut gallery opinions about Suparak and her job performance, the most intriguing piece of the debate involves what's quietly happened around the Warehouse. If you include The Redhouse arts center, the Delavan Art Gallery and the Lipe Art Park, an authentic arts district is quietly growing within that old industrial neighborhood. That evolving personality stands to be strengthened even more if WCNY, a public television station, moves into a proposed $17.5 million headquarters on West Fayette. The noisy public conflict over Suparak and her future is, in a sense, a manifestation of Cantor's wish: Many around Syracuse are bringing the same passion to a debate about downtown and the arts that we more often see around this town about touchdowns and head coaches. You just hope, at a moment of such opportunity, that feuding players on both teams can find their way back to the game.